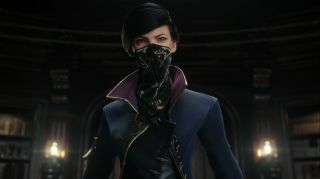 Dishonored 2 video showcases Karnaca, "the jewel of the south"
Bethesda has released another video recorded during E3, this one featuring Arkane Studios Co-Creative Director Harvey Smith talking about, and showing off, Karnaca, the sunny city setting for Dishonored 2. Karnaca, the southernmost city in the Empire of the Isles, is a warmer and more pleasant-looking place than Dunwall, where the original game took place, with plenty of sunshine, lush greenery and nice beaches. "If Dunwall was modeled after Scotland and England, Karnaca might be modeled after Greece or Spain or Italy. It's like southern Europe," Smith says in the video. Which isn't to suggest that it's perfectly happy and trouble-free: Rats are out but bloodflies are in, and they're even more disgusting than Dunwall rodents. They nest inside corpses, and the more corpses you leave lying around, the more grotesque bugs you'll have to deal with. Bethesda hasn't said whether they'll be controllable, as rats are, but they'll definitely be an environmental hazard—probably not the sort of thing you'll want to leave lying around everywhere you go. Dishonored 2 is slated to come out sometime in 2016.